Do you love fresh or toasted wraps for lunch? Well I do! But I am sens itive to gluten and I find that most of the gluten-free versions in the stores tend to be really thin and flaky and don’t hold the filling together well at all. And they always fall apart when toasted under a sandwich press. This cabbage version literally uses a big steamed cabbage leaf AS the wrap. On first thought you might think that it would fall apart, but cabbage is surprisingly strong and well-held together. 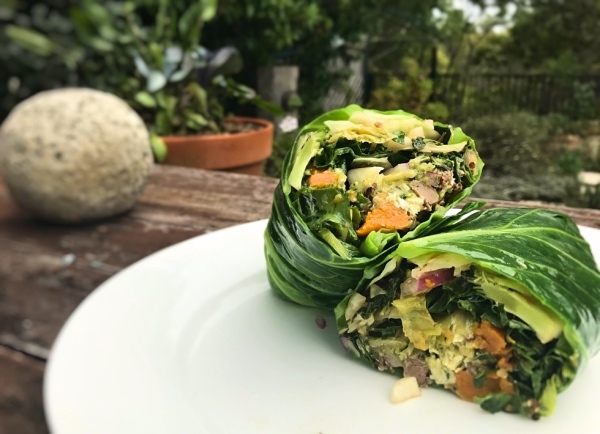 Toasted or fresh, these cabbage wraps are a healthy and tasty alternative to traditional wraps! Superfood Falafels or some left over roast beef/chicken/lamb, ham, salami, tuna etc. Take the cabbage and carefully peel off the outer leaves su ch that they remain whole and unbroken. Depending on the size of the cabbage you can usually get between 7-10 leaves before they start getting less leafy and more cabbage-y. Use a sharp knife to cut out the hard centre part of the leaf that was connected to the root/core. Place about 1 cup of water in a large wok (or pot), and bring to the boil then turn the heat down to simmer. One-by-one boil/steam the cabbage leaves until they are soft and malleable but not falling apart, placing leaves on a tea towel to dry after cooking. If your wok has a lid – this will help speed up the process. Allow leaves to cool and pat dry with tea towels. I find the cooked leaves last well in the fridge for about 5 days. Just store them in an air-tight container or a large zip-lock bag. Take one steamed cabbage leaf and place on a plate. Place your favourite fillings in the centre of the leaf. Fold up the sides and roll the wrap as you would a regular bread wrap. If taking to work – wrap the wrap in al-foil to help stay together. Otherwise, eat as is or slice in half and enjoy the two halves!